The members of Hexas should be familiar to compulsiononline readers, as it is a collaborative project of Gaya Donadio and Patrick Leagas. Of course, Gaya Donadio is ACL/AntiChildLeague while Patrick Leagas is 6 Comm, Godlesstate. This isn't the first time the duo have worked together. Gaya Donadio has provided percussion to Patrick's Schräge Musik project and performed live with 6 Comm. Hexas, however, is their first collaborative project and it is an intriguing proposition. As ACL Gaya is involved in power electronics and noise, while Patrick's solo projects have more of an inclination towards atmospheric and eastern beats. Hexas brings them together with the focus on vibrant rhythmic tracks. 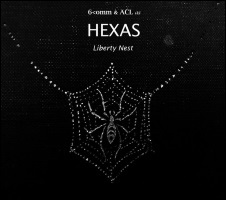 With Gaya taking on more of the vocal duties and the stream of noise textures that run throughout Liberty Nest shares an affinity with ACL but naturally because of the rhythms elements of Patrick's past seep through, reminding us of his solo work and the dance beats that informed his earlier project, the "pagan dance" outfit Mother Destruction. And yet while Liberty Nest carries echoes of their individual work it also bring something new, something vibrant to the six tracks that comprise Liberty Nest. Liberty Nest opens to the rhythmic power electronics of the title track; unleashing noise lashings over a pummelling thud and electronic rhythms as a backdrop to Gaya's treated rasp. It sinks into noise textures before reappearing accompanied by metal bashing and wooshing synths. You could consider the opener a more rhythmic continuation of Gaya's ACL outlet but when Patrick's voice appears on the following track, 'Reptilian Culture' you know Hexas is truly a collaborative effort. This isn't one for Patrick's distinctive croon that featured on 6 Comm's Headless and on the eponymous Godlesstate album though. With a whir and skittering bass tones source Patrick's voices rises, rages and roars over the rolling electronic beats amidst occasional flurries of hand rhythms and short bursts of frequencies. Incessant and intense, 'Reptilian Culture' pounds like an evil industrial take on the pagan dance outfit Mother Destruction, this time with Patrick at the vocal helm. Liberty Nest digs further back with the experimental noise of 'Helborn' and the retro-industrial electronics of 'Art Demands War'. Almost based on a NON-like cyclical siren based sound, 'Helborn' is drenched in noise textures and rhythmic lashings as Gaya continually intones about hell, on this reworking of 'Born From Hell... Into Hell' from the AntiChildLeague album The Son. There's a vintage industrial feel to 'Art Demands War', with its pulsing analogue electronics and words derived from a collage of samples. Revolving around the lines "Peace is degeneration...There is no revolution without war" it's a singular piece on Liberty Nest but it's wonderful and well worth hearing reminding me of something like Cabaret Voltaire from The Voice of America. The final tracks return to a more rhythmically charged sound. 'Beneath the Sun' pulses to a low-key unceasing rhythm cut with darkened electronics and spoken and slightly treated vocals from Gaya. Powerfully atmospheric it appears to offer new directions for Hexas to follow up on, as those beats, sweeping up additional atmospheric layers and tones, could easily crossover into a more dancefloor friendly outing. The paired voices of Gaya and Patrick converge over the clipped rhythms of the final track 'Me and I'. It carries a more ritualistic thrust especially with Gaya's self-centred incantations over its hammering percussion and passages of church organ. Darkly powerful, the closing section features shouts and harsher beats with Gaya proclaiming "I'm special, I am something special" providing a fitting climax to Liberty Nest.